Before you set your PGA DFS lineups on sites like DraftKings and FanDuel for the 2019 RBC Heritage, you need to hear what Mike McClure has to say. McClure is a DFS pro with nearly $2 million in career winnings, and he's been red-hot on his PGA Tour picks this season. McClure is also a predictive data engineer at SportsLine who uses a powerful prediction model that simulates every tournament 10,000 times, taking factors like statistical trends, past results and current form into account. This allows him to find the best PGA DFS values and create optimal lineups that he shares only at SportsLine. They're a must-see for any PGA DFS player. Last week at the Masters, McClure built his PGA DFS lineups around Dustin Johnson. 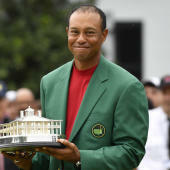 The result: Johnson fired four consecutive rounds under par on his way to a score of 12-under and a second-place finish to Tiger Woods. Anybody who had him in their lineup was well on their way to a huge weekend. Now, McClure has set his sights on the RBC Heritage 2019 and revealed his optimal PGA DFS lineups. You can only see them at SportsLine. One player McClure is all over at the RBC Heritage 2019: Tommy Fleetwood at $11,300 on FanDuel and $9,200 on DraftKings. The 28-year-old Englishman is still looking for his first career PGA Tour victory, but he has five international wins and has been on the cusp of breaking through on the PGA Tour several times. He finished second at the 2018 U.S. Open, one of six top-10 finishes last year. And he comes into the 2019 RBC Heritage having finished fifth or better in two of his last four PGA Tour starts. Fleetwood ranks fourth on the PGA Tour in holes per eagle (72.0) and 17th in scoring average (70.114), which should allow him to rack up PGA Tour DFS points at Harbour Town Golf Links. Lock him in as one of the top overall 2019 RBC Heritage DFS plays. We can tell you McClure's optimal PGA DFS strategy also includes rostering Johnson again this week at $12,400 on FanDuel and $11,600 on DraftKings. The No. 1 ranked player in the world has been red-hot in recent weeks, recording five top-10 finishes in his last six starts. And he'll enter this week's event with the second best scoring average (69.536) on the PGA Tour. McClure is also targeting an undervalued player who's primed to blow up this week, giving you a huge return on DraftKings and FanDuel. Picks like these could be the difference between winning your PGA DFS contests or going home with nothing. So what 2019 RBC Heritage lineup should you enter on DraftKings or FanDuel? And which undervalued golfer is a must-roster? Visit SportsLine now to see the complete optimal tournament lineups for FanDuel and DraftKings, all from the man who's made nearly $2 million in daily fantasy sports, and find out.